It’s been a little while since we’ve heard from this promising new electric mobility startup, and one of the reasons is that SF Motors* has been quietly working on making parking your car more convenient and hassle free. Self-parking is a hot topic. Veteran drivers laugh at the idea of cars parking themselves. However, a closer look at the reality of daily driving shows a need for some help. Ford started a parallel parking feature in 2011. I was privy to a private demonstration in its Dearborn, Michigan, headquarters. It was an odd sensation feeling a car parking itself. All I had to do was press on the accelerator and the brake pedal while going from drive to reverse. The rest was handled by the car, which turned the steering wheel while adjusting the parking angle. It was a funky feeling for someone who had been driving for over 30 years. SF Motors upped the ante with a promising patent it has filed. The global electric mobility company was founded in California in 2016. Kyle Field and I covered the official unveiling of the SF7 and SF5 earlier this year. The company announced it received an autonomous parking patent from the United States Patent and Trademark Office. Patent No. 10,106,153 was granted on October 23, 2018. 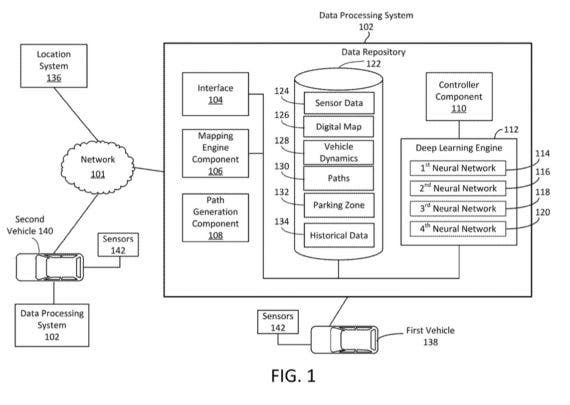 The patent covers the design and method for a fully autonomous parking method. Essentially, once the technology is deployed in SF Motors’ consumer products, it will allow the company’s electric vehicles (EV) to “self-park safely and accurately in complex parking zones without operator intervention.” And considering we all care about the state of our cars, this is a good thing that sadly needs to happen. If the technology still makes you shake your head, put it this way: Collector cars are still out there. I have two in my garage that rarely see the light of day. Technology marches on, even if we remain attached to the old stuff. Parking currently means dealing with bumps and scrapes for many cars. Considering how many vehicles leave their tow-hooks on without hauling anything, with the potential to leave behind serious damage, self-parking cars may be a good thing. The SF Motors autonomous parking patent is a fair bit more involved than the aforementioned Ford parking helper. The technology has matured enough to use an advanced digital architecture that includes an impressive array of digital learning-based systems. These systems allow the vehicle to park itself regardless of parking space orientation, if there are adjacent cars, or if there are obstacles in the way. Specifically, SF Motors uses various types of sensors, including cameras and LiDAR, the get the job done in a smooth and safe manner. The SF Motors autonomous parking patent technology is part of the company’s larger vision, which aims to offer intelligent EVs that are safe, reliable, and convenient to use. The SF Motors autonomous parking patent is part of the company’s overall strategy to gradually deliver a suite of Protective Autonomy features to enhance safety and convenience in the company’s EVs. The company says the autonomous parking system has gone through rigorous safety standards. SF Motors says it plans to deliver its first intelligent electric vehicle in China sometime at the end of 2019. We’re looking forward to testing the SF Motors autonomous parking patent as well as its EVs.